For 90 minutes at the Shanghai International Circuit, there was mayhem and madness. Pitstops aplenty, overtaking moves up and down the grid, but just one single retirement. Lewis Hamilton barely made it out of the garage to start the race, Mark Webber clawed his way through the field from an 18th position grid slot, whilst Jenson Button couldn't remember which was his pit box. It was all happening in China, too much to summarise here, so why not relive the race lap by lap with these Factbyte Factbox highlights. Hello and welcome to the Factbyte Factbox for the Chinese GP. We've got just an hour to go before the third race of the season gets underway - our first back to back of the year. Sebastian Vettel starts from the best possible position, securing his third pole position of the year yesterday. The main news of qualifying, aside from Vettel's speed again, was Mark Webber qualifying way down in 18th. You can join in the comments there, or try the fancy Dashboard: https://sidepodcast.com/dashboard Comments, Twitter and this here FBFB all in one place. Here's how the front of the grid lines up. Both Toro Rosso drivers got through to Q3 which was pretty impressive. Paul di Resta did a great job to start from 8th, whilst Rosberg rocketed up to 4th. 5live's Anthony Davidson isn't sure about the rollerskating entertainment either. Comment from paul: how many screens does the FBFB think I have? The drivers are getting strapped into the car, ready for the pit lane to open in a few minutes. Jake Humphrey fact: Vettel has been on the front row of the grid at every Grand Prix since Italy last year. Petrov gets strapped into his car. The pitlane is open and cars are filtering out to take up their positions on the grid. Thirty minutes until the race begins. Interview with Lewis Hamilton - on whether they are getting near to Red Bull: "In the last race it looked like we closed the gap, but they slowed down, I'm certain of it." Interview with Mark Webber: "We're really going to be on the back foot for the first part of the Grand Prix, then try to capitalise on some good strategy, get something out of it. I had a look at some previous starts, but I said to the boys, I might need a pair of binoculars to see the lights today." Also, when asked if he's going to be running KERS or not he said: "We are going to try to use it." There's a bit of panic happening in the McLaren garage. Hamilton sits in the car with mechanics running around him. They have a few minutes before the pit lane closes again. With five minutes left on the clock, they are taking the airbox off the McLaren. A fuel line has come loose on Hamilton's car, a mechanic is running around with a fire extinguisher. They've got two minutes before a potential start from the pit lane. With 40 seconds to go, Hamilton leaves the garage and will take his place on the grid. Turn 14 - otherwise known as the big braking zone at the end of the long back straight. Interview with Jonathan Neale, managing director at McLaren:"The engine fired up fine during the hour before the race, came to fire up again but it just wasn't firing... the only conclusion we could come up with was we had flooded the engine in some way. As you saw a massive scramble... but we're there." Live timing has cleared, and we have less than ten minutes to go. We've closed the pole and 89% of people believe Webber can finish in the points. Let's see how he goes! Poll, pole, you know what I mean. The grid has cleared and the drivers head off on the formation lap. Webber gets an update from his engineer on the tyres the drivers around him are on - all options. Webber himself is starting on the hards. Vettel pulls to a halt in his pole position grid slot. The rest of the pack lines up behind him, and we await the lights. Vettel had a terrible start, two McLaren's ahead of him, he's now battling with Nico for third. Vettel has the edge for the position, and pushes Rosberg wide. Now both Ferraris are chasing the Mercedes. Webber only made up one place on the start. A nice clear first corner, yet again. One day we'll have some chaos at the first corner, I know it. Button pulls out a bit of a lead, 1.3 seconds over Hamilton. Petrov has lost a couple of places on the first lap, currently running 12th. Team radio to Button: "Okay Jenson, let's put some gap between us and the rest of the field before DRS kicks in." Webber overtakes Pérez for 16th. Replays show that Vettel's start wasn't due to any KERS issue, it seemed just a poor getaway. Race Control: Liuzzi is under investigation for jumping the start. Team radio from Paul di Resta: "I have a lot of problems with the rear." Race Control: Liuzzi gets a drive through penalty for jumping the start. Petrov overtakes Alguersuari for 11th place. They are currently 12th and 13th. Ted News: Red Bull and McLaren are furiously tapping away on their computers working out strategies. Webber should pit sooner rather than later, they were expecting him to be further up than this. Webber has lost a position to Pérez, fallen back to 16th. Heidfeld finds himself sandwiched between the Toro Rossos now, having overtaken one and chasing another. Alguersuari makes it a bit easier for him by pitting. That's an early stop, first pit stop at lap 10. Alguersuari's stop didn't go well at all, he's now circling the track minus a right rear wheel. Webber and Maldonado both pit. Jaime with just three wheels. Paul di Resta now comes in for his pit stop. Alguersuari stopped out on track, his race over. Rosberg pits from 4th place, ruining my one to watch table. He returns to the track in 10th place. Buemi is also in from 13th. Vettel is closing up to Hamilton now, just half a second behind. The Red Bull mechanics are poised and ready to go though. Webber has set, out of nowhere, the fastest lap of the race so far: 1:43.468. The Red Bull mechanics stand down. None of the top three pitted. Hamilton loses his place to Vettel, the Red Bull now up to 2nd place. Vettel and Button both pit this lap, releasing Hamilton again. Unusually, Button opted to run through the Red Bull pit box, and then moved on to his own team. The Red Bull mechanics were not at all impressed! Massa and Hamilton are both in this lap. Alonso now leads, having not stopped yet. Alonso pits from the lead. Rosberg is now upfront, with one pit stop completed. Petrov was sitting second, having yet to stop, but he just lost the position to a speedy Sebastian Vettel. Comment from Pat W: Everyone's passing Heidfeld, why doesn't he get new tyres? Trying to stretch out a two-stopper? Heidfeld has pitted from 9th place. We haven't had anyone lapped yet, but Rosberg is exactly the length of the back straight behind Liuzzi. Tweet from @autosportlive: Alonso has lost out badly and runs ninth now with di Resta 10th, Sutil 11th, Kobayashi 12th and Webber up to 13th. Ah ha, a mystery is solved. Down the back straight, Massa was behind Hamilton, he overtook him at the hairpin at turn 14 and then dove straight into the pits. Team radio to Rosberg: "If you can lift 25 metres early for brakes, 25 metres where you can." It looks like a Sauber, Pérez, has a bit of front wing missing. Rosberg's lead is up to 5 seconds now. He's got a healthy lead but how does his strategy compare to those around him? Webber is advised over the radio not to use KERS. McLaren mechanics arrive in the pits, and Jenson Button has come in. McLaren are in the pits yet again, with Hamilton following Rosberg in. Webber also pits from 13th place. On his new tyres, Button is putting in some of the fastest sector times so far. This stop was 1.3 seconds slower than his first one. That won't help him fight for the lead. Schumacher pits from 5th place. Mark Webber sets the fastest lap of the race... in 15th place... 1:41.200. Nico Rosberg just passed Alonso for position, up to 3rd. Vettel's engineer confirms that he can't hear Seb over the radio. There is some suitably Dalek like sounds from Vettel to prove the point. Jenson Button has also made it passed Alonso, as the Ferrari slips down the order. Tweet from @autosportlive: Button has much fresher rubber than Alonso and is the next man to comfortably pass the two-stopping Ferrari. Low tech solution to informing the drivers about the DRS zone. Sutil, Kobayashi and Heidfeld all pit at the same time from the midfield. Vettel pits, handing Massa the lead... for now. Alonso pits from sixth place, finally getting some fresh tyres. Felipe Massa pits from the lead, Rosberg is back up front again. Webber is up to 8th place, battling with Petrov. He takes the position, after Petrov made it a bit too easy for him. Apologies for the crush, but Vettel is used to leading by this much! Hamilton overtakes Button for the position, Jenson didn't put up too much of a fight, but equally, they avoided an inter-team crash. Button pits from 3rd place and returns to the track in 5th. Webber squeezes past Michael Schumacher for 6th position. Meanwhile, Hamilton has pitted and retains the position ahead of Button. Nico Rosberg comes in for his stop from the lead of the race, and rejoins just in front of Hamilton. Compare those times from Kamui, with Button who just set the fastest lap of the race - a 1:40.623. Hamilton locks up terribly, smoke pours from the tyres. He continues on, but if he wasn't planning to pit again, he's made his life a bit tricky. Team radio to Rosberg: "Fuel is critical." Kovalainen, Maldonado and Glock pit from towards the rear of the pack. Hamilton is closing up on Rosberg. Rosberg allows the position to go, Hamilton now up to 3rd. Live timing shows that Jarno Trulli has only stopped once, currently running in17th place ahead of his teammate Kovalainen. Team radio to Massa: "Hamilton is the car behind, we're going to have to start defending from him soon." Heidfeld gets caught up behind Petrov, attempting to overtake but it doesn't work. Pérez closes up to the pair, and there's contact between the Renault and the Sauber. Pérez took the position, with a bit of bodywork flying off one or other of the cars. Lewis Hamilton has taken second place from Felipe Massa. Vettel continues to lead. Webber has managed to pass Alonso for 6th position - at turn six. Rosberg locked up and ran wide, losing a couple of places, he's now 5th, just ahead of Webber. Whilst watching the battles up front, an HRT is shown in the back weaving his way down the straight. Warming up the tyres probably, and not getting in anyone's way. 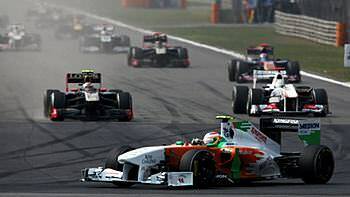 Replays show Sutil turning in on Pérez, the two coming together and running wide off track. Sutil appears to have a broken nose. It's also confirmed that the incident between Pérez and Heidfeld will be investigated. Team radio to Hamilton: "Other cars are struggling badly, we need to make sure you get to the end of your tyres. Vettel will be coming back to you." Race Control: Drive through penalty for Pérez - causing a collision. Sutil and Pérez come together. Radio to Vettel confirms the engineer still can't hear him, but is being urged to stay out. He may be struggling on his tyres. Race Control: Incident between Pérez and Sutil to be investigated. Hamilton is close behind Vettel, this is the battle for the lead. Vettel has stopped twice, so has old tyres. But Hamilton, although stopped three times, isn't so good at looking after his tyres. Whose tyres can hold out? Nico Rosberg overtakes Felipe Massa, the Ferrari running wide off track. Tweet from @autosportlive: Barrichello is up to 13th with Buemi 14th. Perez has slipped down to 15th following that bodged overtaking move and drive-through penalty. Good news, Pastor Maldonado is still running! Down in 18th but still! Five laps left and it is so close between Hamilton and Vettel. Webber overtakes Massa for 5th place. Hamilton is through, in the lead. Comment from Kai: From fuel leak to lead. Mark Webber overtook Rosberg, but outbraked himself, giving the position back. On the next corner, Webber gets the position back, he's up to 4th. Sutil has just unlapped himself, as Vettel tries to keep his tyres going. Team radio to Button: "Webber is close behind, he is going to attack you. He is on fresher tyres. Beware of Webber." Webber has overtaken Button! It's close but he keeps the position and is now looking at a podium finish! Lewis Hamilton wins the Chinese Grand Prix! Vettel comes in second, and Webber amazingly comes third. Hamilton climbs out the car and leaps into the waiting mechanics arms. Much happiness at McLaren. Lewis Hamilton showing a bit of emotion, and perhaps even some tears as they wait to go up on the podium. The three drivers take to the podium, and the National Anthem plays out. Race Control: Heidfeld and di Resta are under investigation for contact just a couple of corners from the end. Hamilton takes stock on the podium. Interview with Martin Whitmarsh: "All sorts of emotions, it's been a challenging weekend. There's so much action... you've just got to get it slightly wrong and you're toast. I think Lewis and Jenson today drove great races... First win of the year is a really important one." Press Conference Quotes - Lewis Hamilton: "The strategy that we came up with definitely helped. My new option tyres seemed to last a bit longer than the guys in front. I think it was quite a few things that came together. The car felt great, I was trying to nurse my tyres fast. It was one of the best races I've experienced, at least this year, where the guys were out in front of me and I had to do a lot of overtaking. It feels amazing to be able to bring home a victory." Press Conference Quotes - Lewis Hamilton: "I was in the car nice and early to go out and we had a problem where the car just wouldn't start... I knew there were six minutes to go, then there was two minutes to go and it all just came together very quickly. I tried to stay positive and they got the car out which was most important." "I came to the box and obviously came out first, it was quite a surprise Jenson in front of me came into my garage. I hoped he would just carry on. Fortunately it had no effect, the guys kept their heads cool, we kept going and came out in the lead. "I think we tried to hard staying on two stops, but surely in the end you'll find yourself out there on the hard tyre, I saw Lewis coming closer and closer. I tried to defend as much as I can but he found his way past easily. It was a difficult race for us... but still we finished second so I'm very happy with that. One race you just try something different, make some mistakes, it's only natural, and there's lots of people around to beat you." Press Conference Quotes - Mark Webber: "It was an interesting Grand Prix. We decided to start on the prime which we know is not the most desired tyre for everyone in the field. Got that out of the way, which was quite tricky. Everyone was using the DRS at the same time, which was predicted. It wasn't easy to come back through those guys. "To still see P17 on your board after 15 laps... and then all of a sudden I just felt comfortable with the car. I had a few sets of tyres left after qualifying. Maybe that's the best way to do it, not even take part in qualifying... but all jokes aside... we're all here together fighting for victory. Shame McLaren won, in a way, but we can't let Seb get away. It was a good day today in terms of racing, and for us in terms of points." Interview with Jenson Button: "Massive congrats to Lewis, he drove a great race. It was one of those races where there was a lot of overtaking... it was good fun to be a part of but I wasn't quick enough. Fourth place is as good as I could get out of the car. "It's enjoyable but also you're a sitting duck when people have got newer tyres, you can't do anything. When Webber passed me, he was so much faster. You try and fight back but you don't have the grip. "Tough afternoon for me. It could have been a lot better but it could have been a lot worse." Just one retirement today, in the form of Jaime Alguersuari. Not a great end to his best ever qualifying position. Interview with Paul di Resta: "It was always going to be quite tough. Again we came very close to scoring points but just missed out, at the end, the tyres gave out... I think having gone into the race without heavy fuel runs maybe compromised us a bit. "We didn't quite get the aero balance... but the second and third stints were pretty good. Maybe a three stop would have been better. But we came here with relatively strong performance to where we have been." The McLaren team have changed into their rocket red winning shirts, and are celebrating in the garage. It's been an action-packed afternoon in China, you couldn't ask for much more in terms of overtaking and pit stop drama. From troubled starts for Lewis Hamilton and Mark Webber, both finished on the podium. It's hard to summarise this race, as there was so much detail through the whole 56 laps. Mercedes seemed improved, with Rosberg leading the race on several occasions. Toro Rosso didn't manage to hold on to their good qualifying spots, and quickly fell down the order. Kovalainen finished well for Lotus, up in 16th, whilst Pérez had a clumsy afternoon, battling with several other cars that ended with collision. Vettel retains his lead on the driver's championship, with Hamilton hopping up to second place. Red Bull are still running away with the constructors... for now. That's it for today, then. Our first back-to-back racing extravaganza is complete. We now have a bit of a break before Turkey. Stay safe and happy fact fans.